NIZHNY NOVGOROD, Russia -- South Korea on Saturday arrived in the Russian city where they will play their first match at the 2018 FIFA World Cup. South Korea's 23-man squad took a chartered flight from Saint Petersburg to land in Nizhny Novgorod, where they will take on Sweden for their Group F opening match at Nizhny Novgorod Stadium on Monday. South Korea, led by head coach Shin Tae-yong, arrived at their World Cup base camp in St. Petersburg, Russia, on Tuesday after training for a week in Austria. In St. Petersburg, the South Koreans focused on shoring up their defense and checking set pieces through their training at Spartak Stadium in Lomonosov. The Taeguk Warriors also had a training session Saturday morning before they took the 90-minute flight to Nizhny Novgorod. South Korea will have their official training in Nizhny Novgorod at 3:30 p.m. Sunday following a pre-match press conference. Sweden are scheduled to begin their official one-hour training session at 11 a.m. the same day. The match between South Korea and Sweden kicks off at 3 p.m.
Monday (local time). South Korea will take a return flight to St. Petersburg three hours after the final whistle. 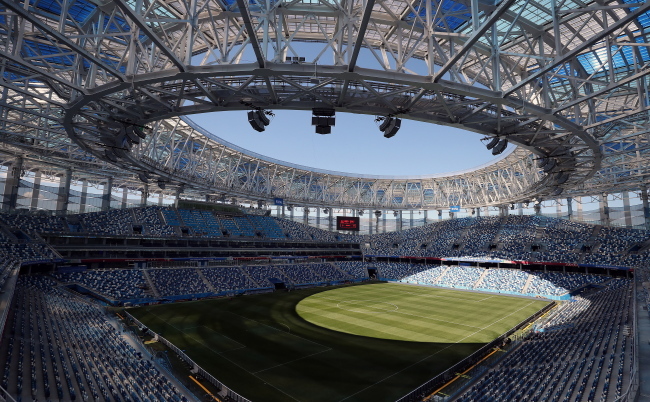 Like all other competition venues at the 2018 World Cup, Nizhny Novgorod Stadium features a hybrid pitch that mixes natural and artificial grass. The home stadium to local club FC Olimpiyets can accommodate 45,000 fans.